When studying the lives of the Mystics of the Church, certain remarkable facts come to light. One of these would certainly be the extraordinary appearences of Saint Therese "the Little Flower" in the lives of the mystics. In light of this St Therese, it seems, could perhaps be condidered a "Patroness of Mystics". 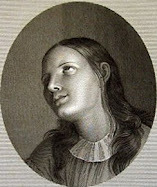 And then again, did she not write in her Autobiography-- "I will spend my heaven doing good upon the earth. 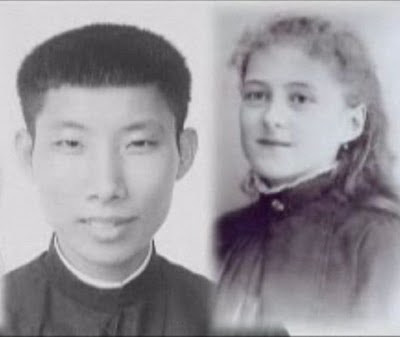 I will let fall a shower of roses"
This first appearance of Saint Therese of the Child Jesus went on for quite sometime, and there were many other appearences of St Therese who became a "spiritual director" to Brother Van. So those interested should read "The Autobiography of Marcel Van" to read all of the intercessions of St Therese in the life of Br. 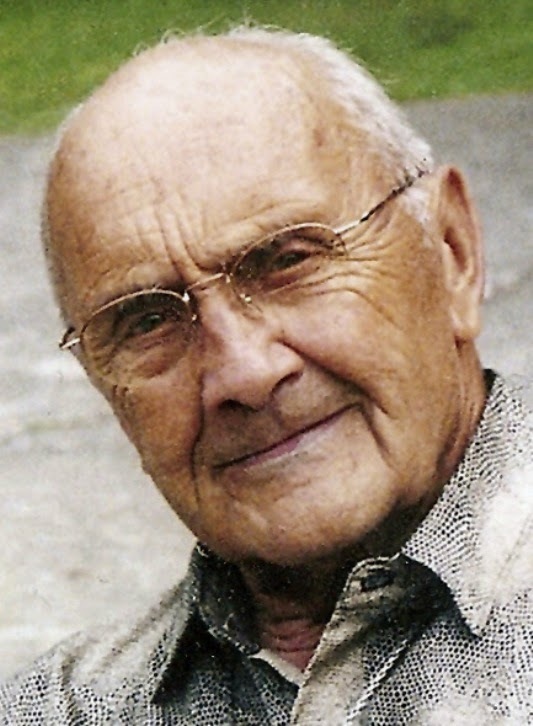 Marcel Van. From then on, St Therese became Van’s close companion and spiritual director, intimately guiding him in his spiritual life and his ascent towards God. I created an article with more information about St Therese's appearences to Br. Marcel Van here. 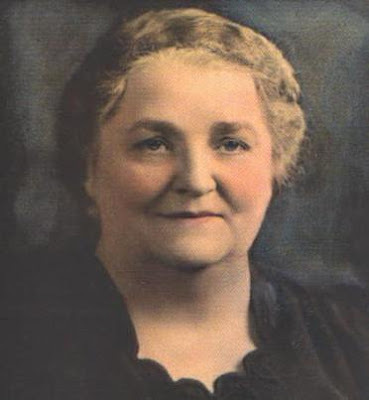 Rhoda Wise lived in Ohio with her husband and daughter. She was a Protestant who was in the last stages 0f stomach cancer when St Therese interceeded for her in a remarkable way. March 25: "…I feel tonight as if even God has forgotten me. I just cannot bear anymore. I know I am going to be in terrible misery if I go home and do not have someone to do my dressings all the time. [Rhoda had what the doctors believed to be stomach cancer, with an open wound in her abdomen that continuously leaked acidic stomach fluids, which caused her painful burning in this area -editor]. I know I cannot get the care I need, for it takes money to do that and there isn't any ... Oh God, I wonder what the outcome will be. You have never failed me yet dear Jesus, and I know that you won't now. When the clouds were darkest and I was in despair you always showed me a way out, so I'll just trust that you to take me out of this .... "
June 28, 1939: "I guess everyone will say I am dreaming again or seeing things. What happened to me was done by no dream. I saw Jesus again last night standing in my bedroom door. While I looked at Him, He said, 'Here I am as I promised.' St. Therese, the Little Flower, was right by Him. She came to my bedside. She wanted the cover off me. I pushed it off. She then wanted the dressings off, so I pushed them off. She put her hand on my stomach and said, 'You doubted me before. You have been tried in the fire and not found wanting. Faith cures all things.' She walked back to Jesus and when I looked at Him He said, 'I will come again. There is work yet to be done.' They vanished. I looked at my stomach. I was entirely healed. Not one drop of anything had even come out of my stomach. That awful irritation and everything was gone. What my feelings were I can never tell…." But Rhoda also had another serious health problem. She had severely broken her foot and ankle one night when she inadvertantly stepped into a sewer hole. The doctors tried repairing the damage to her lower leg and ankle by repeatedly putting various leg casts upon it, but could not seem to repair the severe damage to the bones and surrounding ligaments. She was therefore confined to her bed and unable to walk. In her joy of being cured of her stomach cancer wound, she understandably hadn't even thought about asking St. Therese to obtain a cure also for her foot, because the appearence of Jesus and the Saint along with the instantaneous cure of her abdomen completely astounded her, and filled her heart and soul with unimaginable joy! Aug. 10, 1939: ".....Tomorrow I go in the hospital again. God, may this be the last cast, and if it is Thy Will, may my foot be straight and may I walk." The cast they applied to Rhoda's foot was to be on until November 10. Rhoda's doctor told her there would be a person ready who would fit her with a brace as soon as the cast came off, and that she would be wearing the brace for the rest of her life. The doctor and everyone else was about to see for a second time that Jesus and St Therese had other plans. Aug. 15, 1939:[Feast of the Assumption on the Blessed Virgin Mary] "Oh, what a day! I was so happy to begin with because the Little Flower came to me and cured my foot. I was sitting up in bed and crying because my foot hurt me so much. The Little Flower came and said, 'That is a little thing. Stand up and walk.' I stood right on my feet and the cast broke and I stepped right out of it. She then said, 'Go to church now' .... "
Another miracle! Who can imagine the joy of Rhoda, her family and all who knew her! Her husband George nearly fainted when he walked into the room and saw her standing on her own, the cast shattered all over the floor. Needless to say this second miracle drew a flood of persons wanting to see and talk to the woman of the miracle. 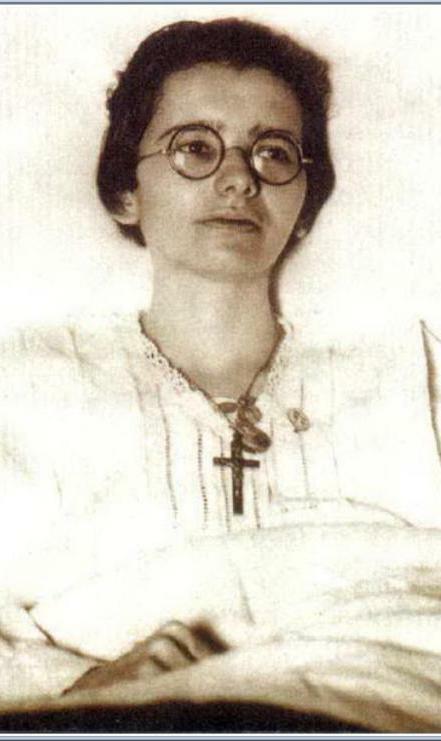 Her apostolate of leading souls to God began and God increased his grace upon her by giving her the stigmata and other mystical gifts. 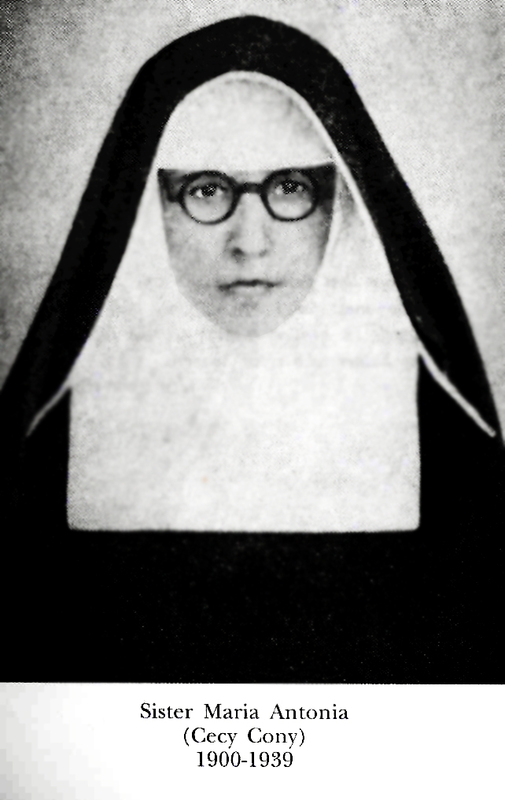 Therese Neumann was a well known German mystic and stigmatist who lived in Germany from 1898-1962. St Therese obtained an extraordinary cures for her both on the day of her Beatification, and on the day of her Canonisation. 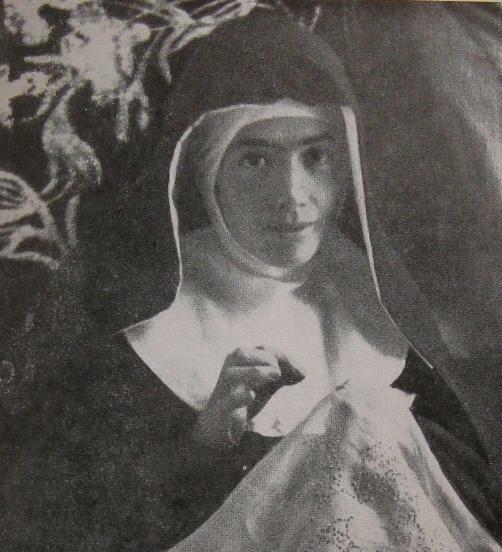 One year later Therese Neuman was to receive the holy Stigmata during Lent, 1926. 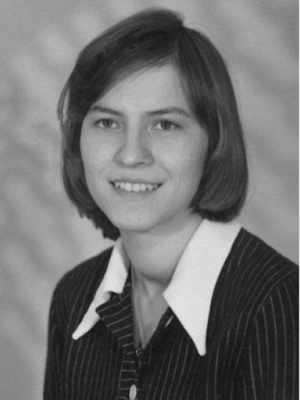 Click here for more information on the victim soul Therese Neumann. 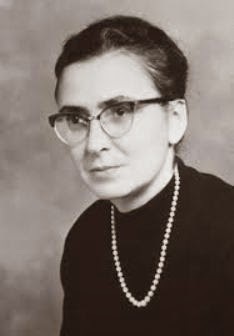 Maria Esperanza de Bianchini (1928-2004) of Betania, Venezuela is a very recent mystic who cause for Beatification-Canonisation is currently at the stage of "Servant of God" in the Catholic church. Maria Esperanza had two very notable visions of St Therese of Lisieux, and perhaps others. "...When we were at the port saying good-bye to my mother, I was on the dock and everyone was saying good-bye to my mother, and I stared at the river that was coming very strongly at us. I was watching waves that were really strong and were going up and down. And I remained there, staring. I had a pain in my heart, feeling as if I couldn't separate myself from my mother. When I saw Saint Therese ... it seems like a distant dream right now. I saw Saint Therese smiling with these big beautiful blue eyes. How precious. And she stayed there staring at me." "There was such a blue, an intense blue in her eyes, almost green. It was such an intense color, it tore at my heart. And she smiled. She arose from the waters, came from the waters and smiled at me. I'm trying to recall everything now, when I was there looking, watching Saint Therese coming up from the water with a rose in her hand. It was a very, very beautiful red rose. And she threw it at me. And I moved around. I don't know how I did it, but I caught it in my hands. And I was so little at the time. I was playing, and I ran to my mother who was leaving, and we were all saying good-bye to her. And I said, "Mom, Saint Therese, Saint Therese!' And my mother said to me, "Oh, my love, God gave you this rose!'" "One day when we were there in prayer, on October 3, 1954, I saw from the altar after Mass ended, there was something incredible that I felt. I saw Saint Therese of the Child Jesus. She threw a rose to me, and this rose, I tried to catch it, just as I had done when I was five years old. But it was a fresh rose. It happened that it pinched me right in my hand, and I saw blood start to come out of my hand. I got very scared, and I felt at that moment that He told me I should not be here anymore, that I should go to Rome to see the Holy Father, because the Lord wants me in the world. "You will be a mother". And they [the Sisters] sent me to Rome. I didn't know what to tell the sisters. It made me ashamed. I felt very bad. I cried alot. It was very difficult, but I had to leave." 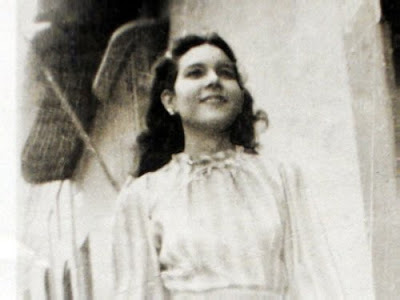 Maria Esperanza was to become a wife and mother, just as St Therese had predicted. 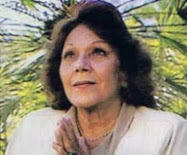 Click here for more information about the Servant of God, Maria Esperanza. 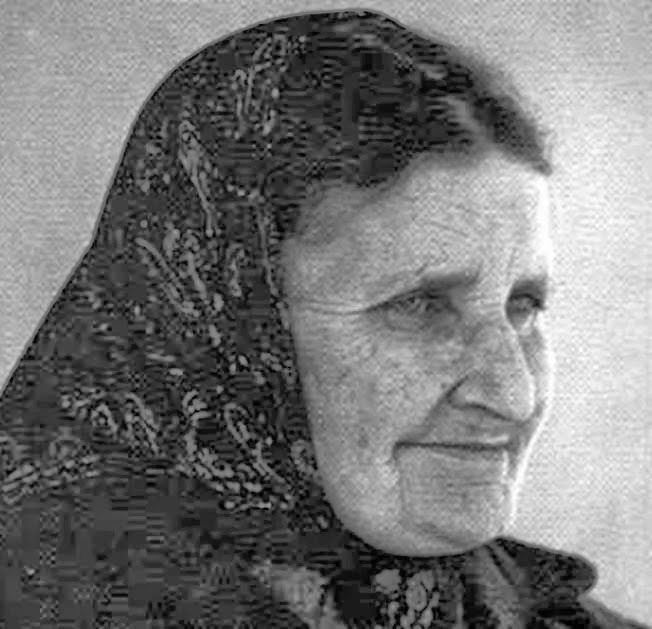 The Servant of God Marthe Robin was an extraordinary French mystic, stigmatist, and victim soul who suffered for over 50 years in union with Jesus for the conversion of souls. She died recently in 1981. 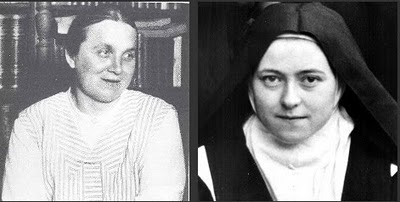 There was quite a close connection between Thérèse and Marthe. Marthe was drawn to the Carmelite life as she entered her twenties, but this hope was frustrated by growing illness. However, in 1925 she received mystical visits from Thérèse on three occasions, and these had a profound effect on her. October 3, 1926, the day of the first celebration of the feast of Saint Therese of Lisieux, who had been canonized the preceding year, Dr. Aristide Sallier of Saint-Uze visited and found Marthe in a coma. "There is nothing more that can be done," was all he said. The Parish Priest, Fr. Faure could only replace the doctor at the bedside to administer the Sacrament of the Sick to "his parishioner," as he called her. It was the second time that she had received it. Everyone expected that each day would bring her death. The coma lasted three weeks. 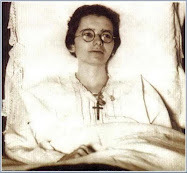 But while the coma progressed and death seemed to be imminent, Marthe experienced three apparitions of Saint Therese of the Child Jesus. The Carmelite of Lisieux revealed to her that she would not die yet and that she would recover, and that she was to be a victim soul who would extend her mission throughout the entire world. 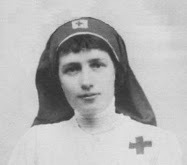 Having surprisingly come out of her coma, Marthe confided the messages of St Therese to Fr. Finet, even adding, laughingly, "Oh that rascal, in the end, she's left it all to me!" 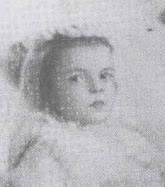 Thanks to a readers suggestion, we have an additional appearence of St Therese in a "dream" of St Faustina Kowalska in entry #150 of her Diary, "Divine Mercy in My Soul"
(150) "I want to write down a dream that I had about Saint Therese of the Child Jesus. I was still a novice at the time and was going through some difficulties which I did not know how to overcome. They were interior difficulties connected with exterior ones. I made novenas to various saints, but the situation grew more and more difficult. The sufferings it caused me were so great that I did not know how to go on living, but suddenly the thought occurred to me that I should pray to Saint Therese of the Child Jesus. 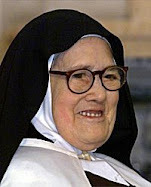 I started a novena to this Saint, because before entering the convent I had had a great devotion to her. Lately I had somewhat neglected this devotion, but in my need I began again to pray with great fervor." "On the fifth day of the novena, I dreamed of Saint Therese, but it was as if she were still living on earth. She hid from me the fact that she was a saint and began to comfort me, saying that I should not be worried about this matter, but should trust more in God. She said, "I suffered greatly, too," but I did not quite believe her and said, "It seems to me that you have not suffered at all." But Saint Therese answered me in a convincing manner that she had suffered very much indeed and said to me, "Sister, know that in three days the difficulty will come to a happy conclusion." When I was not very willing to believe her, she revealed to me that she was a saint. At that moment, a great joy filled my soul, and I said to her, "You are a saint?" "Yes," she answered, "I am a saint. Trust that this matter will be resolved in three days:" And I said, "Dear sweet Therese, tell me, shall I go to heaven?" And she answered, "Yes, you will go to heaven, Sister." "And will I be a saint?" To which she replied, "Yes, you will be a saint." "But, little Therese, shall I be a saint as you are, raised to the altar?" And she answered, "Yes, you will be a saint just as I am, but you must trust in the Lord Jesus." I then asked her if my mother and father would go to heaven, will [unfinished sentence] And she replied that they would. I further asked, "And will my brothers and sisters go to heaven?" She told me to pray hard for them, but gave me no definite answer. I understood that they were in need of much prayer." "This was a dream. And as the proverb goes, dreams are phantoms; God is faith. Nevertheless, three days later the difficulty was solved very easily, just as she had said. And everything in this affair turned out exactly as she said it would. It was a dream, but it had its significance." 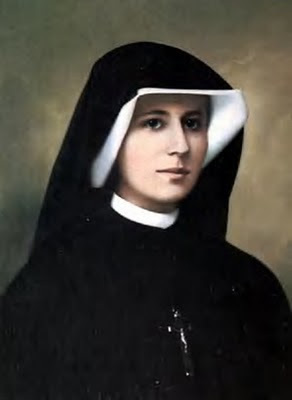 In accordance with the words of St Therese in her dream, Maria Faustina Kowalska was raised to the altars and formally canonised a Saint on Divine Mercy Sunday, April 30, 2000. 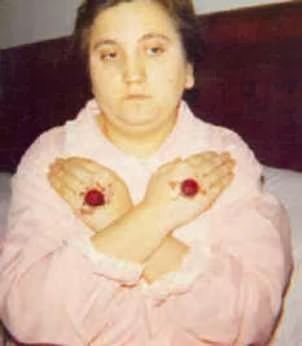 Lastly there is the extraordinary intercession of St Therese in the life of Blessed Elena Aiello, the Italian mystic and stigmatic who was recently Beatified on September 14, 2011. St Therese appeared and assisted Blessed Elena on several occasions, miraculously assisting her in finding the house that was to become an orphanage for young girls, along with being a convent for Mother Elena and her religious sisters. When they got off the bus, the nun pointed to a balcony and said the woman has an offer of 260 lire but will take 250 from you. When Elena looked back at the nun, she noticed there was an unusual glow around her and then saw a bouquet of roses cascading from the crucifix in her hand. Suddenly the nun faded away and Elena recognized that she was speaking to St. Therese of Lisieux and full of excitement went to speak to the landlady. Everything was exactly as St. Therese had said. The landlady accepted the 250 lire. Elena told the Archbishop and he suggested that Elena name their first house in Cosenza after St. Therese, which Blessed Elena gladly did. Upon arriving, Sister Elena too saw the saint smiling at her, and she knew that St Therese's presence was a sign of her heavenly concern and an assurance of her ongoing assistance for Mother Elena's orphanage and her fledgling religious community of Sisters. ~St Therese of the Child Jesus, pray for us! -For those interested, there is an excellent FREE audiobook here which details a number of miracles through the intercession of St Therese that were used for her beatification, or were reported to her Sisters at the Carmel of Lisieux. The stories come from the book "Soeur Therese of Lisieux, The Little Flower of Jesus" edited by Father TN Taylor. "I will spend my heaven doing good upon the earth. I will let fall a shower of roses" -St Therese of Lisieux in her Autobiography "The Story of a Soul"
What a neat article, Glenn! 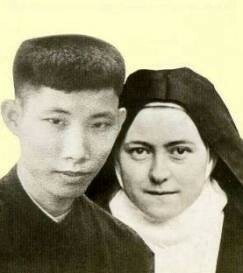 And I especially liked the picture of St. Therese with Brother Van! St. Therese is certainly the great friend of mystical souls, isn't she? And BTW, I just sent you an email to let you know that I'm still 'slogging away' with the Blessed Dina Belanger article. She was a friend of St. Therese, too, though she didn't have any visions of her. I'll give you a little 'sneak preview', however: Our Lord gave St. Therese to Blessed Dina as the guardian of her interior life after she entered the convent in Sillery, Quebec. Thanks so much for working on the Blessed Dina Belange article. I am really looking forward to reading it! And, thanks for your kind comments on the St Therese article. I just found out that the Servant of God Maria Esperanza also received the intercession of St Therese on a few occasions, so I will be adding this to the article soon. Thanks again and may God blees you and yours! O Glenn thank you...sigh...thank you for filling hearts with so much joy and love with these divine stories. Thank you for everything you do in and for the mystical Body of Christ, His Kingdom here on earth. Glenn, You are a saint already ! So many must have come to their senses going through these wonderful pages . I suggest your fervent readers to read the messages given to Ned Dougherty available free on missionofangels.org and then click on Fast Lane to Heaven . They are spectacular. Full of Hope and Love. Thanks for everything . I love this article, thank you so much. I love Saint Therese of the Child Jesus and of the Holy Face. 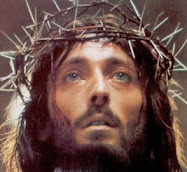 Saint Faustina wrote also an experience she had wiht this great Saint. In her diary we can find it in the number 150. Thank you for putting all this information together, I'm sure it will be very useful to many souls. May God bless you. Thank you so much for the information about the appearence of St Therese in the dream of St Faustina Kowalska, as found in her Diary. I just added this information to the article above. I sincerely appreciate the information. Literally 3 of the 6 mystics listed in this article were suggested by readers. I myself knew of only 3, and I could never compile such information alone, and so I greatly appreciate the input and suggestions of others. Thanks again to you and to all who provide information and suggestions. I've been through a lot of hardship lately. I have been reading about St Therese of Lisieux and am immediately drawn to her. Today after visiting church, I was walking down the street, and I asked for a sign. I was expecting to see a flower but there were none around. Then as I turned the corner and stopped at the pedestrian lights, there was a youngish lady, could have been late 20s with curly shoulder length blonde hair dressed in a bright floral dress with roses motif all over it! She caught my eye and smiled as if to say, "Why do you look so surprised?" The lights turned green and in a second she was gone. I then googled images of St Therese and the resemblance is very striking! I dont know what to make of this but I am very encouraged. One mystic for you to investigate would be Veronica Lueken of Bayside, NY. Our Lady and Jesus appeared to her with messages for us in these times and times to come. St. Therese of Lisieux (who is also my confirmation saint) also appeared to her. I have read most of these messages online at Roses.org ( Our Lady of the Roses, Mary, Help of Mothers) and they are all in line with Church dogma, and the stories of saints and mystics you have posted on your blogs. However, the Church has ignored her completely, but Our Lady does talk about restoring Church altars and traditional reverence for Her Son in the Holy Eucharist. This woman also suffered much. I ask that you investigate these visions and messages, and try to find fault in the loving admonishments of Our Mother. Thank you for your blogs about these saints and the stories of their lives. May God bless you and your family. Thanks for your comment and suggestion of adding Veronica Leuken. I sincerely appreciate it. The reason that I can't add her to this website is that the Church, through the local Bishop, has made a negative decision as to the authenticity of her revelations. 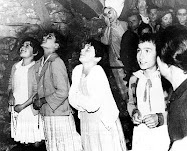 So, since this website endeavors to always be in communion with the judgement of the Catholic church and its teachings, I am sure therefore that you will understand why I cannot add Veronica Leuken and the allged apparitions at Bayside. Thanks again and may God bless you and yours loved ones. Saint Thérèse is immensely powerful. Although being a Catholic, I have never had any mystical experience except the one I'm going to share. Some years ago some relics of the great saint came to my home city of Évora, about 120 km West of Lisbon, Portugal. I was bored because my wife and daughter were shopping, so I decided to head for the city's cathedral. Évora is an archdiocese. There were lots of tourists hanging around. An American tourist asked me what was all that movement about and I told them what was going on. He seemed clueless. I entered the cathedral. There were many people inside. I remember seeing a mother with her child in her arms leaning towards the glass and golden container where the relics were, so that the boy could touch the glass. Suddenly, I felt the strangest feeling of my live. It seemed so natural and at the same time so unusual. I felt as if a breeze was blowing in my face, and I had a brief moment of extreme joy and commotion. I immediately wept. It was a kind of shock, but a tender and gentle one. I felt overwhelmed. After recollecting myself, I prayed for a while (the original aim of my visit) and rejoined my wife and daughter in the shopping district. I almost forgot about this – can't say why – and only much later did I describe it to my wife. I think that's why I said it all felt so natural. The whole thing stayed in the back of my mind until now – and probably for the rest of my life. My beloved father had a great devotion to Saint Thérèse. Thanks for sharing the wonderful grace that you received before the relics of St Therese---she is such a extraordinary Saint! And may St Therese help us to love God with a simple, childlike and humble faith, following her "little way" of devotion to God. -St Therese, pray for us! It is interesting to note that most of these Servants of GOD are women!! Men these days could learn something about cultivating a life of surrender! You right. Years ago when I began studying the lives of the mystics and victim souls I soon discovered that the majority of them are women. I have a few ideas why, but God alone knows for sure. I think overall women have a greater capacity to love and to suffer, and in the eyes of the world they are also the weakest and tend to be more simple, and we see in the Scriptures how God normally chooses the simple and weakest for His works. But I will say that while there are many more women mystics than men, the Catholic Church has also been blessed with some extraordinary male mystics, such as St Padre Pio (who bore the stigmata permanenrtly for 50 years and 3 days), St Francis of Assisi (another stigmatic)and St John of the Cross, to name just a few that have spanned the centuries. I have had several blessings from Saint Therese. One was a hugh downpour of rose oil on my rose bedspread recently. (it stays wet). This morning I was very discouraged and walking to work when I noticed a rose lying right there on the sidewalk. I recently was blessed to travel to Lisieux for a few hours. The person I went with is not Christian and not interested in the miracle of St. Therese's life. As we rushed through her home and the Basilica, I felt tense and wished I had been able to spend hours and days there. I never got to the Carmel and Therese's grave. As we waited for the cab to take us back to the train station, I felt very sad. I looked down and there, lying on the sidewalk a couple feet from where we were waiting for the taxi, was a rose...one lovely rose. I still cry with happiness when I look at the now dried rose lying on my dresser in front of the Smiling Virgin. June 11, 2011 2:56 PM "
As I began to read the second sentence it became very clear to me that I had read this before. I read the entire response and was sure I had read it before and recently. I often times Google things online and stuble upon articles.For the life of me I cannot remember where, when or why I had read this. I had never been to this blog before But I am sure I read that resonse before today. Very strange, that I can't remember, but I now feel a strong connection to your blog and St Therese. I was in the hospital the night before "routine" gall bladder surgery. My mom was sitting by my bed and I had a picture of St. Therese appear in my mind's eye. I told mom this wasn't going to be routine surgery and asked her to pray with me. I had horrific complications, and was deathly ill for two years. But I do want to thank St. Therese for forewarning me and helping me to recover my life. This meant a lot to me as my elderly parents needed my help. I thank her and ask God to accept my suffering in union with that of Christ's to further the miracles St. Therese promised: "I will spend my Heaven doing good upon Earth." Keep helping, St. Therese! Wonderful webpage! Thank you so much and the pictures add much to the articles. Thank you for using your gift in the IT field for God! In 1914 at the outbreak of World War I. Thank you for this wonderful website! I am having been searching for a website such as this to renew and strengthen my faith. St. Therese of Lisieux has so often answered my prayers that I cannot but rejoice and be thankful to this saint who so often intercedes on my behalf. Six years ago as I placed my hands on the relics of St. Therese (they had come to New York), I implored her to watch over my grandmother Gemma who the previous week had been placed in a nursing home. I asked the Little Flower to watch over my grandmother when the time came for her to go to her eternal reward, that it would be peacefully in her sleep with Therese beside her. Two years later, I received a phone call from the nursing home telling me my grandmother had passed away in her sleep that morning. I immediately rushed to the nursing home and was met by the most beautiful scent of roses. I said my prayers, kissed my grandmother one final time And soon came to discover that the day my grandmother died was indeed October 1st, the feast day of St. Therese! Thank you St. Therese. Thanks for your wonderful website. I was born in the 60's on Oct. 3rd, which was the feast day of St. Therese. I've been touched many times by her through the years. I've received roses, rose cards for all my birthdays, etc. I always admired the gorgeous stained glass window in my home church which depicted St. Therese with roses and the words, "I will spend my heaven doing good upon the earth." I read a book about her when I was young that changed my life. I named my youngest daughter Angela Therese Mary... I inherited my Grandmother's large framed picture of St. Therese. 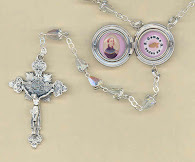 For her first Holy Communion, my 2nd oldest daughter was given a Rosary with a relic of St. Therese on the centerpiece. A few years ago, my 2nd oldest daughter's baby girl died & she had to go to the hospital. It was very sad, but God gave us signs through that tough time to show His great love, including meeting a nurse from France. She was helping my daughter & asked about my daughter's daughter. When my daughter told her the name of her daughter, she exclaimed that she had just dreamt of a baby girl of that name the night before! She took a liking to my daughter who looks somewhat French from her ancestry. She told us that when she was a young girl in France, she & her school mates visited St. Therese's home & convent. She later moved to the USA & married & had a son. She said that when her son was 15 months old, he got very sick & he had to go & stay in the hospital. She & her husband stayed with him there & she stayed overnight, sleeping on a cot. She said when her son was 15 months old, she had a dream that he was reaching & looking up towards Heaven, where St. Therese stood with her arms open to him. She wasn't sure what to make of the dream. She said her son was sick for months & when he was 18 months old, she had another dream. In this dream, he reached his arms up to St. Therese in Heaven & she lifted him up into her arms in Heaven. St. Therese was holding her baby boy in Heaven! She said when she awoke from her dream, no one had to tell her that her son passed away. She knew. She walked down the hall to the room where the hospital staff had taken her son during the night & already knew that he had passed before they even told her. However, thanks to St. Therese, she was at peace. Furthermore, she decided to become a nurse following that whole experience. Thanks be to God, she was the nurse who helped my daughter & me with the death of my daughter's baby girl, (my granddaughter), & her dream of St. Therese was most comforting! It is nice to meet you. Thank you SO MUCH for sharing these beautiful and inspiring stories of the heavenly intercesssion of St Therese. May God be blessed in His glorious Saints! SI pray that St .Therese may conitinue to guide and inspire you and your loved ones. Therese, pray for us! The spirit of "Little Therese" so overwhelmed me during my visit! While I am no mystic, I have been on the receiving end of "the gift of tears" ever since my pilgrimage to Lisieux: when I can feel the presence of St. Therese, acting in my life or in the lives of others, I invariably shed a few tears of joy. It's not a gift I would have asked for, and I've had to endure occasionally tearing up in front of wondering colleagues, but it is very definitely a gift Therese wanted to give me, one I am very grateful for. Reading these accounts and reading the posted comments it is so obvious to me that my "best friend" is busily acting as "best friend" to millions of others who turn to her. Pope John XXIII used to call Therese the "little tugboat" that gets the big ships safely into harbor. May she be always for me, for you, and for your readers that reliable tugboat bringing each one of us fully into the presence of Jesus, our merciful Lord and Savior. I want to see St. Therese. Will she come to me? I have to share this story . Last saturday I was for the first time on this site to read about a saint. And while I was reading I saw the picture of Saint Therese on this site . I always have a resistance about here because my mother is named after her by my grandmother and I don't gave a great bound with my mother. But when I see the foto of Saint - Therese I have always a feeling that she wants that I look at here and talk with here in my prairs. Like this time saterday , I looked at the foto and I felt a sadness that I wouldn't like to read the article. I stopped reading and was busy again with my work in my shop when suddenly there came two young scouts with a rose and asked if I would change the rose for something else. I was amazed and very greatfull and thanked Therese and the heavens for this sign. The first thing that I did was read this article about here. I will keep the rose and never turn away from here. Thanks Glen for this great blog. My tears keep flowing while 'm reading the blog as well as the comments posted. St Therese has been a friend to me when I was still studying in a Catholic School and her book was my companion for the 4 years I was there. It's been 14 years and only from time to time that I call upon her. And today, it keeps ringing on my head her words, "SPENDING HEAVEN ON EARTH" as if she's telling me I've forgotten her. 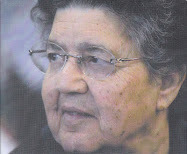 I've forgotten to ask for her intercession through all the days I've been suffering in my heart disease.I've been keeping a stampita of her in my wallet. I promise to remember her all the days onwards. Whether, she heal me or not, she'll be my friend for the rest of my life. St. Therese, pls spend some of your days doing good upon my loveones please. and about experiences which happened with Lebanese people from a direct intercession of Saint Therese de Liseux such as miracles, healings, visions etc… and this program was broadcasted weekly until the month of September. 2- What happened before the visit of Saint Therese? for the first time, I was attracted by the program and by the personality of Saint Therese so I began to watch this program weekly. I started to adore Saint Therese more and more every day and I began to speak to her and to pray to her daily. I felt that she is the only person that has many common things with me and she has a spiritual life similar to mine. heaven? But how? I am laying on my bed, I wish to see this love in my whole life, etc…”. Saint Mary and Jesus are next to me. I didn’t see them in my eyes but I felt their love and their hands touched my heart. I can’t describe in words what happened to me because these things don’t exist in the nature and in the life, but what I can say that this love is much more powerful than a million of Hydrogen bombs of the size of TSAR BOMB. The heavenly thoughts that came to my head were about the love of God about the heaven and other things, I was so pleased with these thoughts and I decided to write them on a paper because at that time I had been writing everything that happened to me, but unfortunately I was afraid to lose these thoughts and this love. So I decided to continue in this love. These supernatural and powerful love, peace and safety continued until the morning at 4:00Am. And after that time the love, peace and safety were taken away from me instantly. I was so refreshed and I continued my day as usual, I started to write what happened to me but I forgot all the thoughts that entered into my head during the night. I began to say “I wish I could remember the thoughts, I am so sorry about forgetting them”. asked for it, but what I told her was just not to forget to visit me when she visited Lebanon. influenced by her life on earth and by her doctrine, and I turned to live a life with approximately the same doctrine as hers but in my way. glorify your name in my whole life and in all things I do and especially in the science, in the music and in my pain. I thank also my sister Saint Therese for her boon, I wish to experience such things in my whole life but it is not my authority to do such things but it is the authority of Jesus. I love you so much Saint Therese and I will love you even with all the sadness in my heart and all bad things that happened to me in my whole life, and I wish to see you again and to give you a hug and kisses. Please don’t forbid me from your love. I present to you all my relatives and all people who I love, and ask you to protect them and help them in their spiritual life and to intercede for them before Jesus. Let’s pray for all people who don’t know the love of Jesus, and let’s demand from Jesus to forgive their sins and to let them see his bright light and his powerful love. Amen. I, too, have a deep devotion to St.Therese of Lisieux. I just returned from Italy and I was present at the Beatification of Pope Paul 6th . 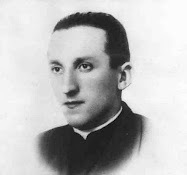 He and his family were deeply devoted to St.Therese. Thanks for your comments--I am happy to hear of your healing, thanks be to God. I assumed it would be okay. Would you perhaps link back to the audiobook as an additional resource on St Therese, it covers various miracles used at her beatification or reported to her Sisters at the Carmel of Lisieux. Thanks for the link to the audio book on the miraculous intercession of St Therese----I added a link to the audiobook at the bottom of the article above. Thanks for linking to my article---I sincerely appreciate it. And please keep up the excellent work that you are doing. May Jesus bless you and your work! "You will help me to shower roses upon the earth!" Truly St. Therese is a powerful, powerful Saint! 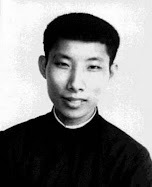 Thank you for the information concerning Sr. Yvonne Aimée--Up to this point I have not heard of her before--very interesting to hear of her! Thanks for this wonderful site, Mr. Dallaire. 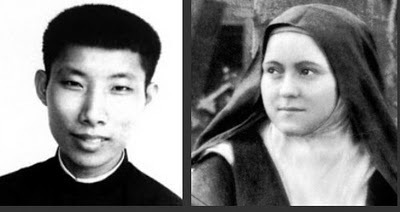 As a long practicing catholic I had never heard of St. Therese, but have this story to relate. Several weeks ago we had returned from the mountains. It was evening and we were in a verdant area near the church. I smelled a fragrance of fresh flowers and thought it must have rained. Continuing on to the highway the fragrance persisted, and I asked my friend if she smelled the fragrance, but she did not. I often read at night, and had started downloading religious books as opposed to the Frank Sinatra bio. I was a couple hundred pages in to The History of a Soul when I finally made the connection to in prior incident described. I began the novena to St. Therese for my son, and initially gave no thought to finding flowers after 5 days. When I reconsidered though I was skeptical as here in Panama we are in a drought combined with the dry season. I was stunned to find dozens of tiny purple flowers growing near the house. In addition I also found three large red rose petals strangely laying in the street and I have kept them. I can only conclude that time is near, and I thank St. Therese for the wonderful joy and awareness she has brought me. In re the comments about most mystics being women: These days many of us men (and a few women I suppose) are examining our consciences about how we may have been complicit in a culture that took advantage of women or aided it indirectly, sometimes by making light of harassment or excusing it. It's sort of a limited "Warning," in a way. I can't recall such a social upheaval like this one in which some kinds of actions and motives are nearly universally condemned by the culture. 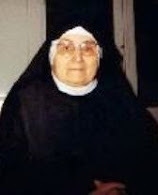 I found that St. Theresa of Lisieux also appeared to Blessed Alexandrina Maria da Costa. St. Therese of Lisieux must have been a very holy saint if she appeared to so many other saints and holy people. Keep up the great work on this fantastic website! I have made so many friends in Heaven because of this website. It has changed my life and the lives of my family members! Last week I was crying because my sister refused to stay with my children so I can look for a jobit abroad. 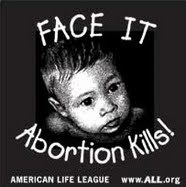 Am a single mum of two kids and mum died when I was 8 months and daddy when I was 24 years. I cried alot and asked God why he took mum but then I said He knows best and he has great plans for me. On Sunday after communion as I closed my eyes I saw a carmelite nun wearing like St Teresa stanning near the altar. I opened my eyes and closed again and I saw same and I knew it was her. Since then I have been wanting to know more about her although I like very much to call her when am praying. I know St Teresa of infant Jesus want to be my friend. 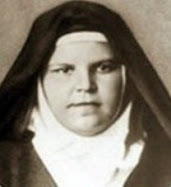 St Terese of infant Jesus pray for me.